How to create Cloud Foundry web app on IBM Bluemix? Bluemix is latest cloud offering from IBM.Currently IBM is offering free 30 days trial of Bluemix.There is no requirement to enter your credit card details.This is indeed very good opportunity to play with Bluemix.I wanted to use this opportunity to play with this cloud platform. 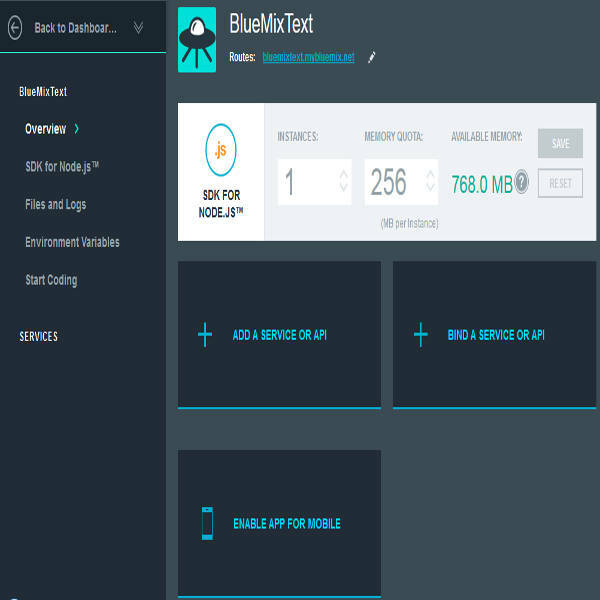 In this post I will list out steps to create your first web app on IBM Bluemix.This post is one of series of posts I have written on Bluemix platform.I have covered mobile apps on Bluemix in a separate tutorial.Some of the steps in both tutorial are same.So you can read this tutorial first and then read the mobile apps one if you are interested in creating mobile apps powered by Bluemix. This is step by step tutorial.You can follow the steps in parallel to create your own app. You need to create IBM id to get started.You can use your existing email id to create one.Creating IBM id is very easy.You just have to fill in some details to create the id.So I am not covering it in detail here.After creating IBM id you can sign in to Bluemix from this link.After sign in you will see Bluemix initial dashboard (as shown in the image below). From the initial screen you can create Cloud Foundry app,Containers and Virtual Machines.But before creating an app or container or virtual machine you should create a space for them as mentioned in next step. 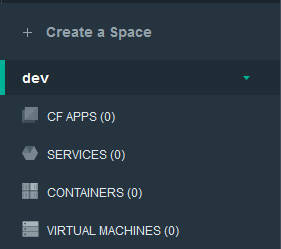 All your Bluemix apps should be under a space.So before creating an app you should create a space.To create an space click Create Space option from the dashboard.The option is situated on the left hand side of the page.After you click on the option a pop up is shown. On the pop you can enter the space name.It can be anything.You can also create multiple spaces as well.In the image shown you can see the dev space I created.Under a space you can create different types of apps as mentioned in next step. Initial Bluemix dashboard will present you four options.These four options are currently supported by Bluemix platform. Cloud Foundry Apps – We will discuss Cloud Foundry web App in this tutorial. Containers – I will cover it in separate tutorial.Link will be updated soon. Services & APIs – Different Services offered by Bluemix.You can read this post (Link will be updated soon) for details of all services offered by Bluemix platform. The above are options displayed in image of first step.Now click on the Create App option under Cloud Foundry Apps.You will see page similar to below image.The below page gives you option to create web app or mobile app.Since we are creating web app you need to click the web app option. The steps so far are same for Cloud Foundry Mobile app as well as Cloud Foundry web app.From next steps we will discuss about steps applicable for web app only. So far it has been very easy.I was fairly happy with simplicity.Every thing was only matter of clicks.But the runtime option made me extremely happy.Bluemix offers support for quite large number of runtimes.Most of the popular languages are supported out of the box. The below image shows the screen displayed after you selected web app or mobile app option.The screen shows list of all runtimes supported by IBM Bluemix.The runtimes supported are Liberty for Java,SDK for Node.js,Go,PHP,Python,Ruby,ASP.NET 5.The options presented will be sufficient for most of the users.If not then you can use community buildpacks or can create your own buildpack. After you have made decision about the runtime you will be presented with below image.On the screen give your app a name.If you are not using any custom domain then the app name will become part of your web app URL.The web app url will be something like your-app-name.mybluemix.net. 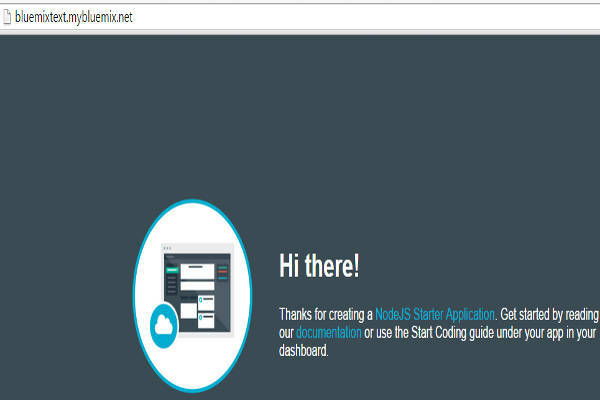 After above steps your app will be live on your-app-name.mybluemix.net URL.You can browse it and see something similar to below image.Note your message may differ a bit.You will get similar message if you have chosen node.js runtime.Now that your app is live and accessible it is time to extend your app. 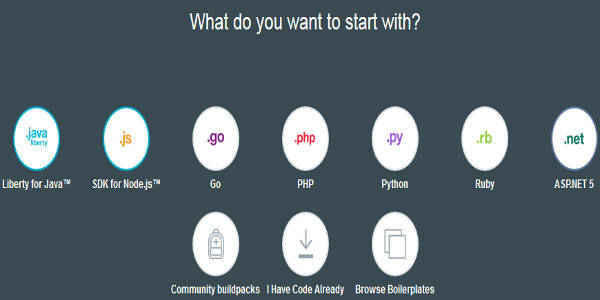 I have covered this topic in separate post Develop and deploy Bluemix app.Bluemix supports multiple ways to code and deploy your app on Bluemix platform.Since it is big topic to cover I have covered this in separate post.It is worth mentioning that the development and deployment cycle is independent of the runtime you choose. READ How to create iOS8 app with IBM Bluemix? Increase or decrease memory quota of your app by clicking on memory quota displayed in below image. Above I have tried to present flow of creating a Cloud Foundry web app on Bluemix.The idea was to give you brief overview of the process.You can treat this as Getting started tutorial.This will help you create default template.Once you have created the App you can perform advance actions including adding services as per your app requirement,read ways to develop and deploy your app and interacting with different services offered by Bluemix. I have written separate tutorials on these advanced topics as well.You can also share your questions or topics you want me to touch upon as well. Previous Previous post: How to add Rate this App in Intel XDK? One comment How to create Cloud Foundry web app on IBM Bluemix?